We will refer to the Gospel according to St. Luke frequently in the course of this Advent calendar. Along with St. Matthew, Luke offers the events before the birth of Jesus as well as episodes from His childhood (the two other Evangelists, Mark and John, begin their Gospels with Christ's public ministry). Luke was most likely a Gentile doctor who accompanied St. Paul on numerous missions, notably to Greece, Macedonia, and Jerusalem. The Gospel according to St. Luke was written in the latter part of the 1st century A.D. in idiomatic Greek and with Gentile readers in mind. None of this explains why the book contains such treasures for the reader and the artist. There are two Annunciations in Luke; the Angel Gabriel comes to Elizabeth first and then to Mary. In Luke we hear for the first time the great hymns which will inspire mankind with hope: the Ave Marie and the Magnificat. In Luke we find out why Jesus of Nazareth was born in Bethlehem. In Luke, the Angels of the Lord are awesome beings, striking fear and terror at first and then great joy. In short, there simply wouldn't be a Christmas to celebrate without the events narrated in Luke. 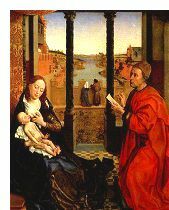 Luke was the patron saint of doctors and artists. In our painting, Rogier van der Weyden takes off from Jan Van Eyck's The Virgin of Chancellor Rolin, putting St. Luke in the place of the Chancellor. He presents us with a scene that does not take place in the Gospel but which gathers its inspiration from the book. This is how Luke worked: a man both reverent and analytical. Weyden has given him the penetrating eye and the supple hand of an artist (some scholars believe it is a self-portrait). I urge you to go see St. Luke Painting the Virgin and Child at the Hermitage Museum website, and use their zoom feature to enlarge and study St. Luke's face. It is a marvel worthy of the man.